Be an “angel” for a classroom in need! The more time children spend reading in their classroom, the better readers they become. But what about classrooms without enough books? Schools in low income areas often don’t have the resources to purchase books for their individual classroom libraries. That’s why we came up with Book Angels! Book Angels is a book donation program designed to provide new books to impoverished schools so they can build and supplement their classroom libraries. 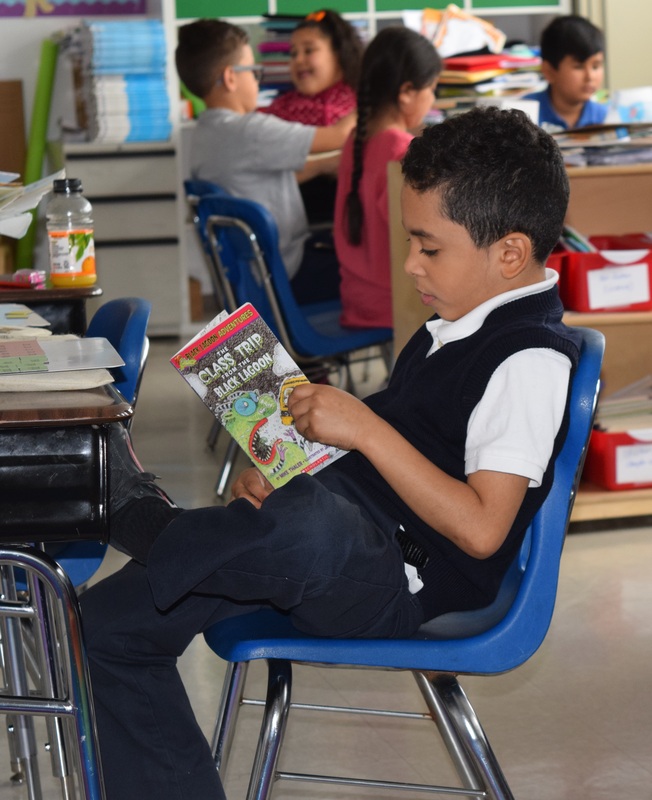 The goal of the program is to ensure that a wide variety of reading-level appropriate books are available for students to bring home from school, or to read in their classrooms. We’ll match you up with a classroom in need. We’ll provide you with the teacher’s book wish-list through an amazon.com link, and ask you to send that classroom one book a month during the school year (9-10 books a year). You can either choose your book from the wish-list or pick out another age appropriate book you would like to share. We’ll ask the teacher in “your” linked classroom to send a note for the Book Angels every month (we’ll forward it to you) updating you on the growth of the library! I am a 4th grade teacher in Rich Hill, MO. I would like to tell you a little more about the dynamics of my school and community so you can see what a good cause you are supporting by choosing to be a donor. Many of our students come from poverty stricken homes. As teachers at Rich Hill, we often have to take care of our children’s personal needs, before we can focus on academic needs. That being said, we are so proud of the progress that our students make! They perform very well on end of year assessments and they LOVE reading. My class, myself included, were so grateful for all of your generous donations to our classroom library. Being chosen as a classroom to be sponsored was such a blessing. We cumulatively received right around 200 books from February to May! The size of our classroom library nearly doubled. We received a broad range of book selections from classic children’s literature like Charlotte’s Webb and The Indian in the Cupboard, to popular series like Upside Down Magic, Dork Diaries, and Geronimo Stilton, to nonfiction selections like many National Geographic Readers. Every time we would receive a “book package” and my principal would deliver them, my students would call her “Santa Claus.” They would be so excited and all huddle around my desk to see what new books we had received for the month. It has been so fulfilling watching their excitement and enthusiasm of reading heighten through this program. Thank you again for your generosity and support of education and children’s literature. We are so appreciative for your gifts. May God Bless You! Are you a school interested in receiving books through Book Angels?